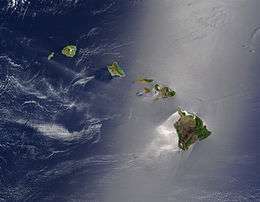 An example of cladogenesis today is the Hawaiian archipelago, to which stray organisms traveled across the ocean via ocean currents and winds. Most of the species on the islands are not found anywhere else on Earth due to evolutionary divergence. Cladogenesis is an evolutionary splitting event where a parent species splits into two distinct species, forming a clade. This event usually occurs when a few organisms end up in new, often distant areas or when environmental changes cause several extinctions, opening up ecological niches for the survivors. The events that cause these species to originally separate from each other over distant areas may still allow both of the species to have equal chances of surviving, reproducing, and even evolving to better suit their environments while still being two distinct species. Cladogenesis is in contrast to anagenesis, in which an ancestral species gradually accumulates change, and eventually, when enough is accumulated, the species is sufficiently distinct and different enough from its original starting form that it can be labeled as a new form - a new species. Note that here the lineage in a phylogenetic tree does not split. To determine whether a speciation event is cladogenesis, researchers may use simulation, evidence from fossils, molecular evidence from the DNA of different living species, or modelling. It has however been questioned whether the distinction between cladogenesis and anagenesis is necessary at all in evolutionary theory. ↑ Gould, Stephen Jay; Eldredge, Niles (1977). "Punctuated equilibria: the tempo and mode of evolution reconsidered" (PDF). Paleobiology. 3 (2): 115–151 . doi:10.1017/s0094837300005224. ↑ Strotz, LC; Allen, AP (2013). "Assessing the role of cladogenesis in macroevolution by integrating fossil and molecular evidence". PNAS. 110 (8): 2904–9. doi:10.1073/pnas.1208302110. ↑ Vaux, F; Trewick, SA; Morgan-Richards, M (2016). "Lineages, splits and divergence challenge whether the terms anagenesis and cladogenesis are necessary". Biol J Linnean Soc. 117 (2): 165–176. doi:10.1111/bij.12665. Korotayev, Andrey (2004). World Religions and Social Evolution of the Old World Oikumene Civilizations: A Cross-cultural Perspective (First ed.). Lewiston, New York: Edwin Mellen Press. ISBN 0-7734-6310-0. (on the applicability of this notion to the study of social evolution).